After completing our annual pilgrimage to those sucrose-laden shores of Disney World last week, I can attest that the American consumer is both present in droves and larger than ever. And although I reluctantly signed on for the Disney experience many years ago against the better judgement of my uptight (i.e. WASP) upbringing to interactive vacations with the masses (see - Big Fat Greek Wedding - character of Ian Miller), I did marry into an orthodox and gregarious (a rare but loving combination) Mediterranean family who finds great joys in experiencing the parks many amusements from sunrise to well past sunset. Needless to say, and very much like the movie - I am a convert. With that said, I am quite happy to be home from what inevitably becomes our own version of the Amazing Race - gluttony edition. If nothing else, Disney is a shocking anthropologic mirror to peer into. With attendance in Magic Kingdom alone topping more than 17 million visitors a year (highest in the world), it presents guests with a rare and unique cross section of consumerism - specifically, American consumerism. Although it's exceedingly unscientific and biased, due to the fact that the large ones tend to catch your eye faster than the svelte ones - it's becoming painful, both literally and figuratively - to walk the parks and watch the American population become increasingly obese and unkempt. Further exemplifying this is the now burgeoning cottage industry of off-site scooter rentals that caters to this ever growing demographic. All is needed is a quick phone call to the local Orlando chariot salesman and for a reasonable fee they will drop a sturdy scooter off at your hotel or park of choice. Getting back to the business of the markets, I have my doubts on whether the exuberance witnessed in the endless waist lines or in the general consumption index of plastic figurines is a harbinger for another irrational trip down memory lane. However, the SPX finds itself once again within striking distance of the Meridian threshold (currently crayoned ~ 1441), that has in the past differentiated exuberance, both the irrational (96-00) and rational (03-07) variety - from everything else. It should be duly noted to market participants that up until February, the SPX was very much following (both structurally speaking and contrasted with momentum) the previous occasions (post 1987 and 1994) where the tape was rejected by the Meridian. Since then, it has audibled from that script quite considerably - both in terms of the duration and magnitude of the retracement rally. While the market was initially in lock-step (see Here) with the post 1987 crash analog, and very closely following the RSI pivots of the 1994 market (see Here), the current tape has simply failed to correct for anything more than a few sessions since early December. In essence, it has displayed even more exuberance than both comparable rallies that took place within a secular bull market. The old saying on the breathtaking, albeit volumeless nature of a bear market rally comes to mind. Some things to consider here. 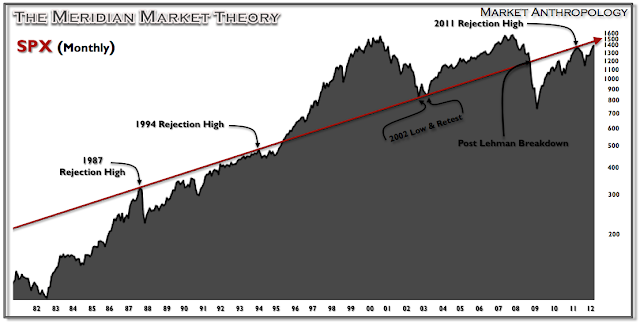 There are parallels with the current market to the 1994/1995 time period that go beyond simply the structure and occurrence of the Meridian rejection. I suppose they would fall more into similarities and contrasts (within the charts) in the business cycle - although I use that phrase extremely loosely here since they have been "stealing from Peter to pay Paul" since the financial crisis began. As evidenced in the chart below of the S&P 500 Banks Industry Group (GSPBK), both periods are subsequent to a major financial crisis in the banking sector. With respect to duration, structure and momentum - they have trended along very similar lines. Both timeframes have occurred where the sector has consolidated the considerable gains out of the crisis low. As noted in the chart, the consolidation range was broken in 1995 when the broader market breached the Meridian and ushered in what we know refer to as irrational exuberance. 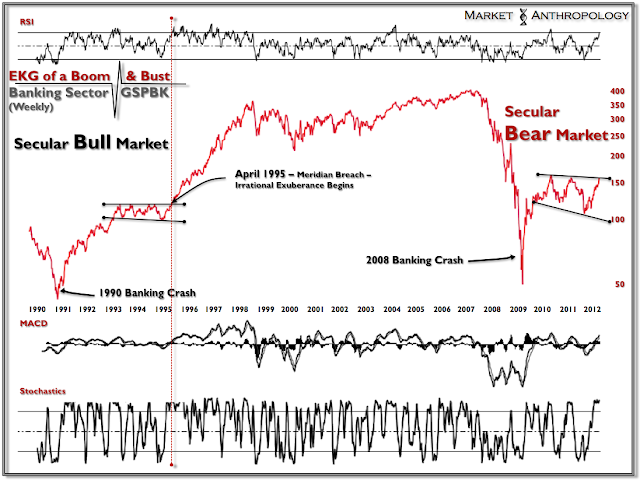 Of course the primary difference when comparing the current recovery to the 1994/1995 time period is that the current rally is taking place within a secular bear market. This is clearly on display when contrasting the SPX with the Bank:SPX ratio. Could another April breach of the Meridian be in the market's future? Anything is possible (especially with a FED chairman bent on slowing the U.S. dollar's ascent), but from this perspective, and very much like the growing assemblage of my fellow American's - the current market is perhaps just irrationally supersized than exuberant here. As always - stay frosty - lean and clean. As a postscript and considering I have been away "vacationing" for the past week, I wanted to thank Alan Abelson again for mentioning my work in Barron's last week (see Here). As someone who appreciates both his mastery as a wordsmith and insightful curator of market research, it's always a treat and humbling experience to hear from Mr. Abelson.